The first time I heard of Deborah Garner was when I bought, read and reviewed Cranberry Bluff. 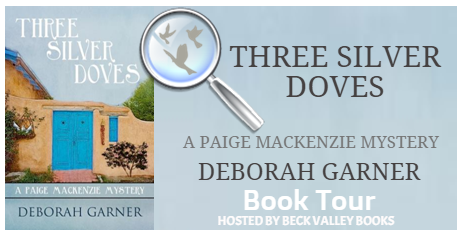 When asked if I would like to read Three Silver Doves I immediately accepted. 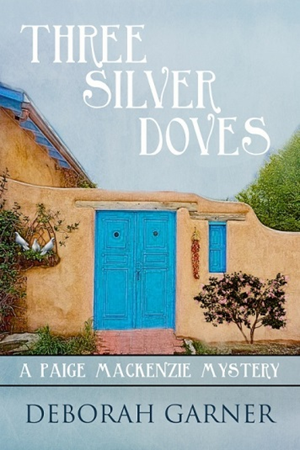 Three Silver Doves is actually part of a series, "A Paige MacKenzie Mystery. I have not yet read the others but this read well as a stand alone-even though it does make references to the others on occasion. It is also a quick read!! Paige MacKenzie is a NYC reporter who often travels on assignment. Her editor asked that she go and check out a mineral springs resort in Tres Palomas, New Mexico-- Aqua Escantada. Deciding she could really use a vacation she extends her visit beyond that which it would take her to write an article on this resort. The secondary characters are great--and lend a lot to this novel. This is a clean, cozy mystery you will not want to miss!! When New York reporter Paige MacKenzie heads to Tres Palomas, New Mexico, the resort of Agua Encantada seems a perfect destination to combine work with pleasure. A quick article on the healing mineral springs and a few leisurely soaking sessions in the resort’s soothing waters promises well-deserved rest and relaxation. Paige is immediately intrigued with a local artist's one-of-a-kind jewelry designs, as well as weekly gatherings to hear legends from an elderly storyteller. But when identical jewelry shows up on another guest and the storyteller goes missing, Paige's R&R is soon redefined as restlessness and risk. Curious and persistent by nature, Paige is convinced there's a connection. Enlisting the help of a flirtatious resort worker seems like a good idea until it begins to test her loyalty to her favorite cowboy, Jake Norris. Will an unexpected overnight trip to Tierra Roja Casino lead her to the answers she seeks, or are darker secrets lurking along the way? What a great giveaway as I am always after that next interesting read to share with friends! Thanks for sharing your review and will have to check this author out more! This is definitely a book that I would be interested in reading. It actually sounds like she is an author I would like in general. Lol it sounds like she just can't resist finding out what is going on, hubbie is actually reading this one at the moment. Oh boy sounds like the trouble I have gotten myself into in the past! Sounds like a great read! Jewelry will always get you gals in trouble! ;) Kidding aside, sounds like a great read! This is the first time I heard about the author. I would love to read this book. I love discovering new authors. I look forward to reading this book. Thanks for sharing. I absolutely love book giveaways because it is a wonderful way to try to read new authors and learn about what is new in the book world. Thanks for sharing! I love finding new books and authors to read and your reviews never disappoint. Thank you! I like that she enjoys snooping and sticking her nose where it doesn't belong. That makes for a more interesting character. Perfect timing, I'm working on my summer reading list! I love mysteries and this one sounds right up my alley! This is the first time that I am hearing of this author. Her books sound fascinating. What a great giveaway too. Get away from it all by reading a good book. Thanks for the giveaway and review! We're always looking for new books and these reviews help so much more than what you can find elsewhere. Wow, what a fun book. Who isn't a sucker for great jewelry? I can't get enough books onto my reading list. This one is definitely going on the list and the road trip! Ooooo this book sounds like another goodie!!! I just finished reading a book today while my daughter swam thins afternoon, maybe I will check out this one next! I haven't heard of this author before, but it definitely sounds like a good read. I'll have to check out her other books too. This sounds like a great mystery read indeed and I love these type of characters in mystery stories. I will have to read this one and maybe the series. Thanks for sharing. I liked all these characters too. This was a good mystery. OooOOoohhhh sounds like a juicy, easy read! I love those! Sounds like a fun read and definitely entering the giveaway! Fun!! I love a good, clean read! This books sounds perfect for the beach or pool! I was looking for some summer reading material! THis sounds great! Thanks for sharing! That book cover really reels me in. I love that blue door! I love a good mystery. Sounds like a good beach read. This sounds like a good read, and I LOVE that cover. So nicely done, it would catch my attention for sure on a book shelf! Always in search of some new books to add to the beach bag - great reviews you have. I'll have to check out a few more. Thanks! I did a search & everything - there still wasn't a 2nd . . .? I like to go up in the mountains to a little place on the river with hot springs. My fave destination for complete R&R is my bathroom with a bubble bath, wine and a good book. Sedona Arizona is my complete R&R spot! Myrtle Beach, SC is my favorite R&R location! !